I thought I share a photo with you because lately I was a bit more silent. I played a lot more guitar than doing anything for my blog. Apart from that, real life kept me busy as well. But if you know me, that’s how I always dealt with my blog. Sometimes I am quiet, and other times I am annoying you with tons of posts per days (laugh). So, I went through my photo library and found the picture above. I shot the photo in November 2016 in the evening. I remember that I did pack my camera into the bag with the goal to practice night photography. 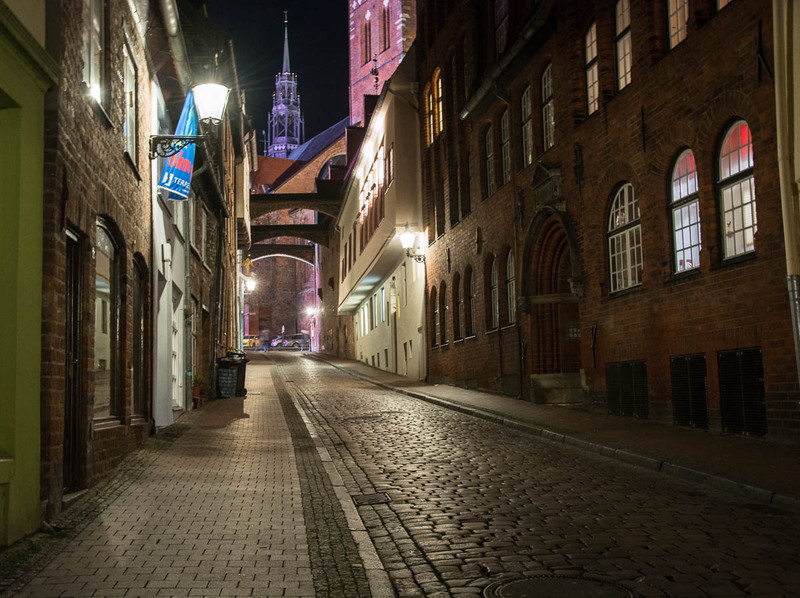 I shot the photo in the historic district of Lübeck near the St. Jakobi church. I found it a bit difficult to take the photo, but not because it was already dark. It was difficult to frame the shot, and to get the angle right. This scene was strange because the street goes upwards, and the houses on the side don’t have straight walls either, you see that if you pay attention to the transitions (lines) from house to house. Even during editing it confused me, because you can’t use the straighten the image in the vertical if every line in the image is different than the other, if everything is basically crooked. I eventually gave up and uploaded the image without straightening, because hey, old alleys and gothic brick architecture just look crooked and that’s fine. That is an excellent night photo. When I walk through the histroric district in the evening, and when the church bells ring, I sometimes feel like walking through a medieval town, or like living in medieval time. That’s probably what the tourists find interesting, that particular district gives you this type of vibe. It just feels old. 🙂 I like that too. Since I live in a more modern district, it’s a bit like time traveling when I have to run errands in the historic district 🙂 It’s not big but definitely special. I like the feel of an old town. here in America, old is usually not much more than 100 years, that is why I would love to visit Deutschland. Our favorite vacation spot is Saint Augustine, Florida. It is the oldest city in the United States which is why it is so interesting. But also in your case there are many interesting things. You told me once about a place where you can see things from the colonial times. Maybe it was even a photo on your blog. I think that might have been Saint Augustine we talked about? I guess, the things is… everything is more interesting than the own place, because we are used to it and see the things every day where we live. You are right. We all want to see something different. The United States has many great things to see. For Europeans, I think the vast areas of unspoiled nature would be an appeal. It is for me too. I like getting out of the city to visit a nature park. It is a great opportunity to take landscape and wildlife photos. Thought this was the gothic quarter in Barcelona at first glance.. I searched for images via Google, wow that place looks awesome too! It’s the same here. The historic district has a bit of old architecture and alleys… but I don’t think it would take much time to see everything. We have many tourists during summer and I often wonder for how long they are here. Talking about Lübeck and culture/architecture, I’d say you could see everything in 3 days. But it still makes sense to stay longer because there are many interesting things outside of Lübeck (nature reserves and beaches, interesting towns and small forests), or surrounding cities like Hamburg, Kiel and so. Lubeck… Isn’t that the home of marzipan?? Apart from that we are probably also know for Dräger, the company that builds all kind of devices and equipment for firefighters, hospitals, doctors and what not. Oh that’s great. Quite a famous city. Love real marzipan! Beautiful 🙂 It’s not easy to get a shot like that just right! I like the lighting in this shot. It is a wonderful old street and you are lucky to have such an interesting historic area so close to home. Having steady hands is really useful as it is a nuisance to carry a tripod long distances. David had very steady hands for that sort of photography, I don’t so I’m grateful for anit shake features. I used to compensate by using faster film. What I like about night photos is that these artificial lights have a very warm tone. I am a bit lucky because I noticed that my hands doing quite well with very low shutter speeds. I discovered some postures that help me to keep my hands steady. I barely used my tripod, and I actually planned to sell it… but I won’t do that because now I noticed that it’s useful if I want to record myself playing guitar. That’s pretty much the only case where I use it. Apart from that I’d only use it in very extreme super low light situations. Because I do agree, outside a tripod is a nuisance, even with my tripod bag… it’s just annoying to carry additional stuff. I was so excited to get the moon photos that I basically forgot to take my tripod with me. And in that case it was so dark that I had to use very brutal camera settings, and that’s where I had difficulties too to hold my hands steady. So, I was standing there a bit sad that I couldn’t get the moon shots right, but eventually since I was standing on a bridge, I made use of the bridge railing with my elbow and many of the shots turned out good for being “semi-handheld” as you could say lol. Yes, things like walls or even knowing how to stand to make your body like the tripod is useful. I was chatting wth friends the other day, one used to be a photographer and he commented how so many people now see to strike pose when they are taking a photo, we were talking about the way some people have to be photographed everywhere they go. You know the ones.